Should I write for Readers? Should I write for Search Engines? Have you ever asked these questions while writing an article for your blog? If yes, you're not alone. Bloggers often ask these questions to themselves. Some even argue that you should focus on people rather than search engines. 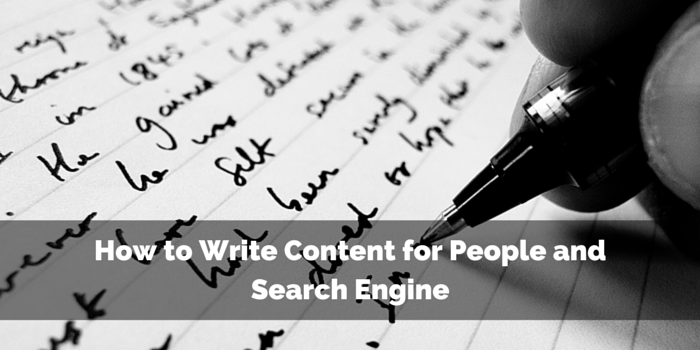 Focusing on people is a good thing, but is it all right to negate the search engine. I'd say you should focus on both: People and Search Engines. The answer is simple, Let's say you write your articles for people, Your blog visitors will love reading your content. As a result your blog visitors will turn into loyal subscribers or customers but for that to happen you need blog traffic which bring new visitors. Blog traffic can be gained through SEO and Marketing. Apart from marketing search engine optimization (SEO) plays an important role to generate organic traffic to your blog. So, We need to focus on both to Create an Epic Blog Post. Okay, Let's not delay any further, Today we're going to learn How to write engaging content for people and optimize it for search engines. How To Optimize your blog post for Search Engine? What are you trying to tell your readers? There are a thousand articles out there about how to write blog content, but do you read each one of them? Online readers don’t spend their time on reading a blog which is full of crap – everyone wants to read unique useful content. Don’t be yet another person to write the same thing. 90% of the online people don’t want to read yet another ordinary posts. The problem with creating content merely for search engines is that it can make it feel completely unnatural. If you are trying to stuff a keyword into every sentence, paragraph and headline, the repetition will turn readers off quickly. Therefore your first objective should be to write in a way that sounds natural. Write like you would talk to a friend. Talk to your readers as if they are sitting in your couch. If your readers like who you are and the way you are talking to them, it is more likely they will come back. I’ve never read a killer article without having sub heads. Sub headings are what makes your blog post look more appealing, and by breaking your content into sub heads – you can easily grab online readers attention. Why using subheads is a MUST? No matter either you’re writing a How to post or a list post – subheads can easily be used. See, this post is the best example. This is actually a How to post, still I’m using subheads, because I know their importance. Since you want to avoid boring your reader with too much information, it is a good idea to write only small pieces of content, right? Short, fluffy articles for easy consumption, correct? It’s true that readers like short pieces of content because they are easier to read. However, what they cherish even more are long-form articles. ALSO READ: Benefits of longer posts. Make your blog posts easy to skim. There’s a hard truth in blogging, most online people don’t read word to word. How can you make it easy for the readers to easily skim through your posts? This will create curiosity to make them read you entire copy. So always write for the web audience, make use of short paragraphs, appealing images, relevant linking etc to quickly grab their attention. Always, This is a MUST, Proofread every piece of content several times. Typos and misspellings (a good tip here is to read backwards! You’ll go much more slowly, focussing on every individual word). Clumsy sentences and confusing or misleading phrasing (try reading your work aloud). Nicely done. Now you should have a well-crafted, well-structured article with a killer headline that delivers massive value and shows off your pleasant personality. More than enough to make potential readers swoon. We should make sure we are using targeted keywords or phrase towards the beginning of Title tag. Do not repeat the same keyword in title tag with the intension to get better rankings on Google, Yahoo and Bing and limit the Title Characters length to 65 Characters only with spaces. Using a clean Parmalink structure can help in search ranking. Avoid using special characters, symbols, brackets, comma’s etc as part of your post URL. Be using dashes to differentiate two strings in URL structure. Never change your post permalink once the post is published. You should create a meta description tag which work as a summary for your blog post. You can see it in the search results underneath the main link. Definitely include the main keyword here. You should limit meta description length to 160 characters including spaces. You should write user friendly meta description tags for better Click Through Rate (CTR) in search engines. As for WordPress you can use SEO plugins to add meta description and for Blogspot blogs you can use search description to add meta description. Images can generate a TON of traffic to your blog from search engines like Google Images. ALT Tag: A good practice for the ALT tag is to keep your alt tags short but descriptive. you can fill your alt tags with relevant keywords, at the same time try to make it describe the image. Compress Images: Images can make your page heavy. You know page load times matter for SEO, right? So, to ensure that your images don’t affect your fast load times, make the image file size as small as possible (without sacrificing quality, of course). you can use image compressor like PunyPNG. File Name: Just like keywords are important in post url, Including rich Keywords in image url can help in better image ranking. Use descriptive filenames in images with keywords separated by “-” (hyphen). For example, “how-to-protect-your-wordpress-site.png”. Didn’t I already say that? Yes, however, headings are important not only for readability, but also for SEO purposes. They help Google grasp the topic of your content (especially for long posts) and can therefore help with your ranking. You should use heading tags like h2, h3 and h4 etc to highlight various headings, sub-headings and important points. Also, don’t repeat H2 or H3 tags too many times, as it is considered as negative SEO practice. When we write a new post, it’s always a good idea to link back to old relevant posts so that readers will find the old posts, and search engines will re-crawl the old blog posts. Interlinking of blog posts naturally will help your blog readers spend more time on your blog. While linking out to your own blog pages, you should use keyword rich anchor text as that will help the linking posts perform better on Google and other search engines for their targeted anchor texts. Apart from linking to your own blog posts, it is a great idea to link out to external websites if you feel addition of this links will help your blog readers find more and relevant information about the topic you are currently blogging about. When you mention another blogger or article in your blog post, include a link to the information you are referencing. Not only is it good blogging etiquette, but you may also get lucky and receive a link back. Quality links are a valuable commodity for any site looking to rank higher in search engine results pages. When creating content, always put the needs of your readers first and Google’s needs second. While organic traffic from search engines is something to be desired, your first goal should be to create excellent content, which your readers will love. If you have any queries or want to add your tip, let me know your feedback via comments. I Am Really Happy To Know About This. Now i use you tips to done my seo much more perfect Really heart full thank to you Chandeep Brother. I just realized the thing that I have to understand my readers. I take time to think about my readers, though this might sound really easy when hearing as a tip, it's lot harder. You said to write naturally, I totally agree, I've to be myself when I write. Excerpt: "Talk to your readers as if they are sitting in your couch"
I think this statement won't be enough to persuade people about it. Some people write too practical, some with humor, some really technical. I don't think that makes a difference if I work consistently, that way, I'll build up my own voice. Excerpt:"you should use keyword rich anchor text as that will help the linking posts perform better on Google"
I heard that too, but also heard that it can cause penalty, can you tell me what are the chances? Maybe some personal tips? And I believe that creating content for search engines and human is not easy, just have to be little smart. Bye for today, looking to hear from you. As for your query, just naturally link to your readers, instead of linking to a post just for the sake of onpage seo, try to link relevant articles in a natural way just like "Joe Pawlikowski" did in the following article. Very good and nice article. It has many deep details about SEO. thanks for your effords. Although it's a great article and tips, but its not so easy to create a devotional content for my website http://www.tirumalahills.org, where you can browse and see how difficult to create content blogs. I need your suggestions and tips to improve it.